While we’re known for our diverse line of commercial, industrial, and institutional doors and door products, Kurtz Hardware offers our customers exciting specialty access solutions as well. 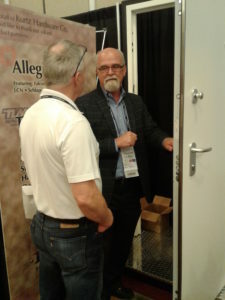 And at this year’s MBI Winter Conference, we unveiled our latest product line from our newest manufacturing partner: the beautiful high-security armored doors from XtremeDoor. 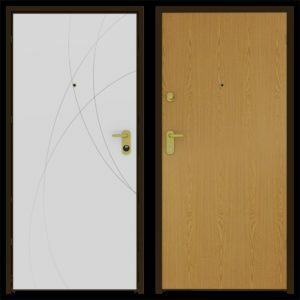 Available in 6’8″ and 7’0″ lengths (8’0″ available by special request), XtremeDoor products are designed with four anti-crowbar devices, a 3-point deadbolt locking system, and a hidden door guard. The hinges are pre-welded into the frame and door leaf. With XtremeDoor, you don’t have to sacrifice beauty for safety and practicality. Offering multiple skin options, units can be customized on the exterior and interior with multiple hardware set styles and skin options — all of which Kurtz can deliver to your location and install at your site. For more information, or to request a quote, call us at 515.288.0148, or email info@kurtzhardware.com to let us know how we can help you to make your home, office, or business more secure. 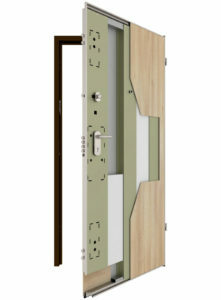 XtremeDoor design features include an adjustable pre-frame, built-in/adjustable draft guard, cabinet-style hinges, anti-crowbar system, and anti-drilling security cylinder lock with A/B key system.